As a seasoned marketing executive, Zara had designed and implemented successful marketing initiatives that had become best practice across the multinational corporation. Despite her finely honed technical and leadership skills, she found herself struggling to keep her head above water with the chronic uncertainty that had become the new normal in her organisation. The frequent restructuring had left employees unsure of their future. Zara was burdened with increasing pressure to maintain her profile. Applying her ‘smarts’ was proving difficult as competition among employees intensified, so Zara decided she should engage a coach. To understand Zara’s situation, we must acknowledge that she is having to operate at a time when the world is catapulting towards the fourth industrial revolution at an exponential pace. The first industrial revolution used water and steam to mechanise production, which was later transformed into mass production using electric power in the second industrial revolution. The third industrial revolution used information technology to automate production. Now the fourth industrial revolution is set to disrupt business models and industries at an unprecedented pace through new technologies that are, according to founder and executive chairman of the World Economic Forum, Klaus Schwab, fusing physical, digital and biological worlds. Think about the possibilities that emerge with 500 billion devices connected to the internet. Coupled with the challenges of exponential population growth and environmental degradation, the result is immense disruption, where the speed of innovation determines whether you disrupt or end up being disrupted. According to John Chambers, previous CEO of CISCO, “probably 40% of the world’s leading companies will not exist in a meaningful way 10 years from now”. This perspective gives new meaning to Zara’s sense that she could no longer get by with her ‘smarts’. The scale of disruption associated with the fourth industrial revolution brings about a chronic instability, where organisations must push the limits of innovation at the edge of chaos, to survive and thrive. This requires leaders to go beyond developing technical and leadership skills to shift the assumptions underlying their perspectives. According to Harvard’s Professor Robert Keagan, “what we mean by maturity in people’s thinking is not a matter of how smart they are, but it is a matter of the order of consciousness in which they exercise their smartness or lack of it”. Keagan states that this maturity increases our ability to operate within complexity as we develop our mindset from a socialised mind in which we attempt to align with the expectations of our role models. We fit in to get ahead. Zara had long moved beyond this and prided herself in having the courage to put forward her perspective, shape the agenda and name the ‘elephant’ in the room. 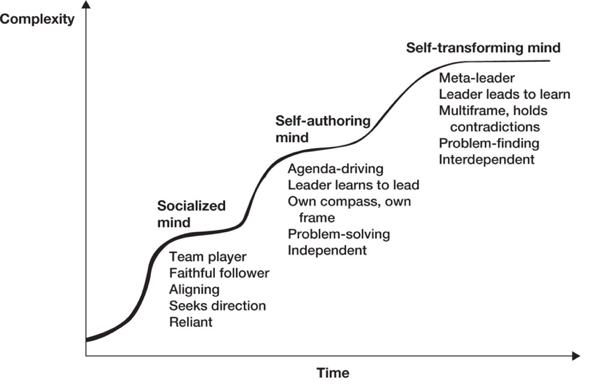 Keagan describes this as the self-authoring mind, in which a leader develops her own compass, and sets the agenda. Instead of looking to others as the authority, you look to yourself as a kind of authority. The trouble for Zara was that she had reached the limits of this mindset. The turbulence and complexity of her work environment required her to let go of having to have the ‘smarts’, and rather to allow herself and her organisation to learn while she led, to engage the ‘smarts’ of the group. Source: Keagan & Lahey (2009:15). The ascending steps over time in Figure 1 reflect what Keagan refers to as the self-transforming mind, a perspective in which you recognise the limits of your own perspective as a leader, and instead choose to focus on your experience of being part of a bigger whole, thereby opening yourself to multiple mindsets that are “true but partial”. It is this that Zara needed. When she found herself in a one-upmanship contest with her nemesis – a rising star in the business – she learnt, with the help of coaching, to change from competing with him to learning collaboratively with him in service of common business interests. Ironically, this didn’t mean losing the battle, but rather resulted in success for both herself and her colleague.